FLUVAL INTERNAL POWER FILTER MINI U1 U2 U3 U4 FISH TANK AQUARIUM. FLUVAL U INTERNAL FILTER RANGE. Fluval U Mini Underwater Filter provides simple yet efficient filtration that helps create excellent aquarium water quality. The filter&###xE2;&###x80;&###x99;s small size makes it ideal for application in small fresh or tropical aquariums up to 45 L.
&###xA0;&###xA0;&###xA0;&###xA0;&###xA0;&###xA0;&###xA0;&##xA0. Ideal for smaller coldwater or tropical aquariums up to 45 L. Fluval U1 Underwater Filter provides efficient filtration to create superior aquarium water quality. The U1 Filter includes practical and versatile features, making it ideal for application in fresh, marine and reptile environments. It has a convenient flip-top lid that allows quick and easy access to the filter cartridge for maintenance or replacement. In addition, the filter can be installed vertically against the aquarium wall to create currents or customized flow patterns; or it can be placed horizontally in shallow water tanks; or it can be used to create decorative features such as waterfalls. The U1 Filter can be used as a primary filter in smaller aquariums or as a supplementary filter for larger aquariums. It is also ideal for tanks with low water levels. It includes an adjustable flow control and comes complete with 1 foam pad. Provides efficient filtration to create superior aquarium water quality. Ideal for application in fresh, marine and reptile environments. Also ideal for tanks with low water levels. Perfect primary filter in smaller aquariums or supplementary filter for larger aquariums. Can also be placed horizontally in shallow water tanks or to create decorative features such as waterfalls. Convenient flip-top lid allows quick and easy access to the filter cartridge for maintenance or replacement. Can be installed vertically against the aquarium wall to create currents or customized flow patterns. Suitable for aquariums up to 55 L (15 US Gal). Wattage: 120V/60Hz &###xE2;&###x80;&###x93; 5 W and 230-240V/50Hz &###xE2;&###x80;&###x93; 4.5 W. Output: 250 L (65 US Gal). Dimensions (L x W x H): 10 x 8 x 15 cm (4 x 3 x 6 in). Fluval U2 Underwater Filter provides complete and efficient 3-stage filtration, including BioMax biological filtering, to create superior aquarium water quality. The U2 Filter includes practical and versatile features, making it ideal for application in fresh, marine and reptile environments. The filter provides the option of setting the flow output in 3 different positions, a key benchmark in underwater filtration. The adjustable 3-way flow control feature lets you position the water flow output to meet your specific needs. The Top Output setting provides maximum circulation and oxygenation, the Integrated Spray Bar setting provides a gentle, even flow for planted aquariums, and the Bottom Output setting is for deep water agitation. The filter also has a convenient flip-top lid that allows quick and easy access to the filter cartridge for maintenance or replacement. The filter can be installed vertically against the aquarium wall to create currents or customized flow patterns; it can be placed horizontally in shallow water tanks; or it can be used to create decorative features such as waterfalls. Provides complete and efficient 3-stage filtration, including BioMax biological filtering, to create superior aquarium water quality. For fresh, marine and reptile environments. Adjustable 3-way flow control feature lets you position the water flow output to meet your specific needs. Top output setting provides maximum circulation and oxygenation. Integrated Spray Bar setting provides a gentle, even flow for planted aquariums. Bottom output setting is for deep water agitation. Can be installed vertically against the aquarium wall to create currents or customized flow patterns&##xA0. Suitable for aquariums from 45 to 110 L (12 to 30 US Gal). &###xA0;&###xA0;&###xA0;&###xA0;&###xA0;&###xA0;&##xA0. Wattage:120V/60Hz &###xE2;&###x80;&###x93; 5 W and 230-240V/50Hz &###xE2;&###x80;&###x93; 5 W. Output: 400 L (105 US Gal). Dimensions (L x W x H): 10 x 9 x 20 cm (4 x 3.5 x 8 in). Fluval U3 Underwater Filter provides complete and efficient 3-stage filtration, including BioMax biological filtering, to create superior aquarium water quality. The U3 Filter includes practical and versatile features, making it ideal for application in fresh, marine and reptile environments. The filter can be installed vertically against the aquarium wall to create currents or customized flow patterns; it can be placed horizontally in shallow water tanks; or it can be used to create decorative features, such as waterfalls. Suitable for aquariums from 90 to 150 L (24 to 40 US Gal). Wattage: 120V/60Hz &###xE2;&###x80;&###x93; 7.5 W and 230-240V/50Hz &###xE2;&###x80;&###x93; 6 W. Output: 600 L (155 US Gal). Dimensions (L x W x H): 10 x 8.3 x 26.7 cm (4 x 3.25 x 10.5 in). Fluval U4 Underwater Filter provides complete and efficient 3-stage filtration, including BioMax biological filtering, to create superior aquarium water quality. The U4 Filter includes practical and versatile features, making it ideal for application in fresh, marine and reptile environments. Top Output setting provides maximum circulation and oxygenation. Bottom Output setting is for deep water agitation. Suitable for aquariums from 130 to 240 L (34 to 65 US Gal). Wattage: 120V/60Hz &###xE2;&###x80;&###x93; 12 W and 230-240V/50Hz &###xE2;&###x80;&###x93; 10 W. Output: 1000 L (260 US Gal). Dimensions (L x W x H): 11 x 10 x 33 cm (4.5 x 4 x 13 in). For all your aquatic, reptile & other pet needs! There are many reasons to shop online with Aquacadabra-Deals-Online. Having traded online for so many years, we were one of the original specialist online aquatic retailers. As such, we have a huge wealth of experience in online trading. At present we list nearly 5,000 specialist aquarium & pet products suitable for Aquatic, Reptile, Cat and Dog enthusiasts. All our items listed are UK spec. We're not just an online aquatic retailer, we are also a specialist aquatic retailer with a bricks and mortar warehouse located in Crayford, Kent, and you are very welcome to visit. Open six days a week and staffed by experienced aquarists with a love for the hobby, our staff don't just manage the welfare of our live stock on site, many also have tropical and marine aquariums at home. It is only by being enthusiasts for the hobby that a true understanding of fish husbandry can be obtained, whether it is understanding the requirements of your fish or knowing the appropriate piece of equipment that you require to succeed in the hobby. One final reason to shop with Aquacadabra-Deals-Online is our inventory. When placing an order with us, you can rest assured we'll have the goods with you as quickly as we possibly can. We feel that offering a large inventory of products at competitive prices, tied to a high level of customer service and the reassurance that we are available for you 6 days a week for any fishy questions that you may have, Aquacadabra-Deals-Online is the one stop shop for all of your aquatic reptile or pet needs. Our website features an extensive online Help section which covers all eventualities with orders; together with easy to complete forms to enable us to address any problems in as quick an efficient a time frame as possible. The item should be in an unopened and unused condition and you should notify us within 14 days that you wish to return the item to us. Please be aware that after bank holidays there is always a back log of orders for us to work through. Order Cancellation or Changes to Orders. Once an order has been placed it will be processed almost immediately. This means if you wish to cancel the order you will need to send the goods back to us once received. This listing is currently undergoing maintenance, we apologise for any inconvenience caused. 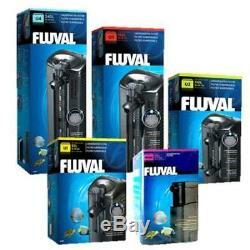 The item "FLUVAL INTERNAL POWER FILTER MINI U1 U2 U3 U4 FISH TANK AQUARIUM" is in sale since Saturday, December 07, 2013. 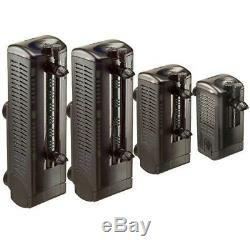 This item is in the category "Pet Supplies\Fish & Aquarium\Filters". The seller is "aquacadabra-deals-online" and is located in Crayford, Kent. This item can be shipped to United Kingdom, Austria, Belgium, Bulgaria, Croatia, Cyprus, Czech republic, Denmark, Estonia, Finland, France, Germany, Greece, Hungary, Ireland, Italy, Latvia, Lithuania, Luxembourg, Malta, Netherlands, Poland, Portugal, Romania, Slovakia, Slovenia, Spain, Sweden, Australia, United States, Russian federation, Canada, Brazil, Japan, New Zealand, China, Israel, Hong Kong, Norway, Indonesia, Malaysia, Mexico, Singapore, South Korea, Switzerland, Taiwan, Thailand, Chile.